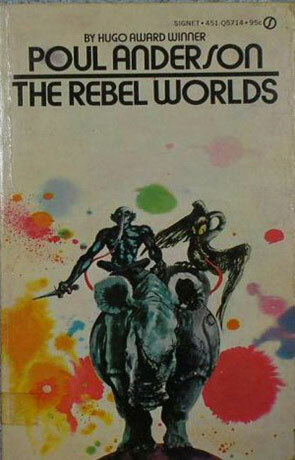 The Rebel Worlds is a science fiction novel by author Poul Anderson. When I’m a bit stressed at my daytime job, I take a lot more care when I select a new book to read. It has to be fairly short if I want to finish it anytime soon, the story line has to be fairly simple and it has to keep me entertained. Poul Andersons Dominic Flandry usually deliveres on these terms. While deliberating whether two or three will be the best number of girls to invite to his “I’m finally off duty” party (He has already decided that the optimum number of men to invite is … zero), Flandry is forced to report, to his senior officer. And, yes, you guessed it, his leave is cancelled and he is off to save the galaxy. I was actually getting interested what he wanted to do with all these girls. Anyway, soon a new girl enters the picture, only this girl is actually more of a lady and not only that, she also happens to be happily married with the commander of the rebel fleet! Dominic more or less takes her hostage (or is it the other way around?) and tries to persuade her that her husband has it all wrong and could she please divorce him while she is at it and go away with Flandry instead? Throw in a couple of strange aliens and wicked living-on-the-wrong-side-of-the-tracks space barbarians and we have ourselves a nice little action adventure. Packing it all into a hundred and forty pages Anderson leaves little room for bathroom breaks or subtlety – but then again, what wasn’t what we where looking for, where it? Written on 24th June 2002 by TC.